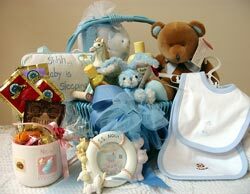 A delightful array of baby blue treasures for the new baby boy. A Russ teddy bear plush, a soft rattle, a door pillow, a baby's first bank, and bib with burping pad are just the beginning. We have added a picture frame, a mug for new mom filled with candies, teas, coffee and cocoa. Bath products are added with a bag containing five deluxe washcloths and terry cloth bear. Shown as large. Can be customized to any price range.